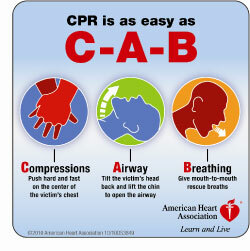 West Mayfield Emergency Response Tip: New CPR Procedure Is Easy! Newest guidelines released by the American Heart Association recommend that the three steps of cardiopulmonary resuscitation (CPR) be rearranged. The new first step is doing chest compressions instead of first establishing the airway and then doing mouth to mouth. The new guidelines apply to adults, children, and infants but exclude newborns. The old way was A-B-C — for airway, breathing and compressions. The new way is C-A-B — for compressions, airway, and breathing. “By starting with chest compressions, that’s easy to remember, and for many victims that alone will be lifesaving,” says Michael R. Sayre, MD, chair of the emergency cardiovascular care committee for the American Heart Association and co-author of the executive summary of the 2010 AHA guidelines for CPR and emergency cardiovascular care. The old approach, he says, was causing delays in chest compressions, which are crucial for keeping the blood circulating.